When my husband and I lived in the Graduate Hospital neighborhood (or whatever trendy names folks are giving it these days,) we spent many a Sunday morning at Cafe Lutecia, a charming french cafe on 23rd & Lombard. We recently woke up on a Sunday morning with our minds and stomachs in the mood for something a little different for brunch. I forget who suggested Cafe Lutecia (these things happen when you’ve been with someone long enough) but the other happily agreed. We found a quick parking spot along Lombard Street and walked into small, packed room with yuppies young and old sipping lattes, chatting and reading the paper. We had to wait awkwardly for a table (there’s no real good spot to wait without feeling like you’re hovering) but were seated quickly. Cafe Lutecia has a sizeable menu of sandwiches, salads and croissants and always has a number of soup and quiche specials. My husband and I were hoping they had the tomato bisque, our old favorite. They always list it as a special but I think it’s a regular menu item. Anyway, who knows. I started with a latte and the husband got his favorite, Orangina. There were a number of appealing options but we both decided on the tomato bisque and sandwiches. Although they have soup and half-sandwich options, we were both pretty hungry. The bisque came pretty quickly with a nice hunk of their chewy baguette for dipping. I literally cannot say enough good things about this soup. 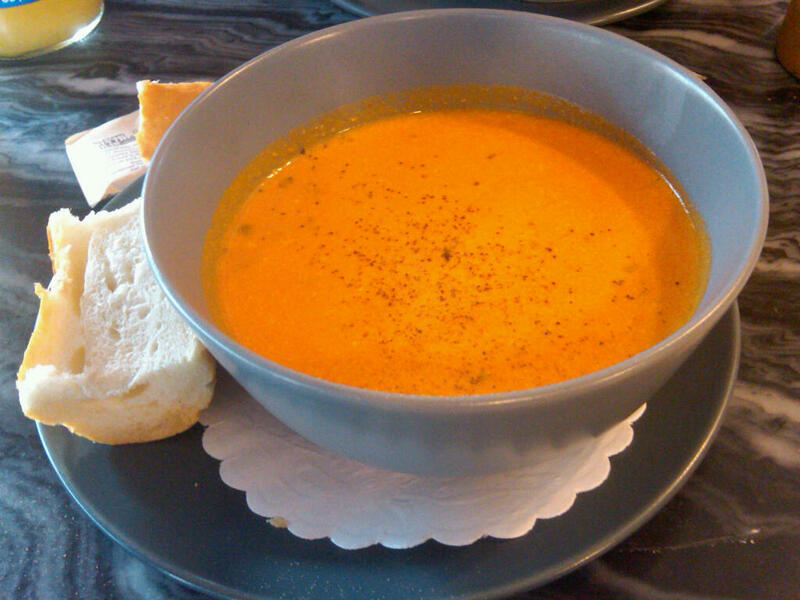 The bisque has a nice creaminess with miniscule, but perfectly placed chunks of tomato and something else–garlic, perhaps? It also has a subtle kick that you don’t taste until your mouth is empty again. It comes steaming hot and you just want to pick up the bowl and drink it. This soup is SO. GOOD. After the soup came our sandwiches. 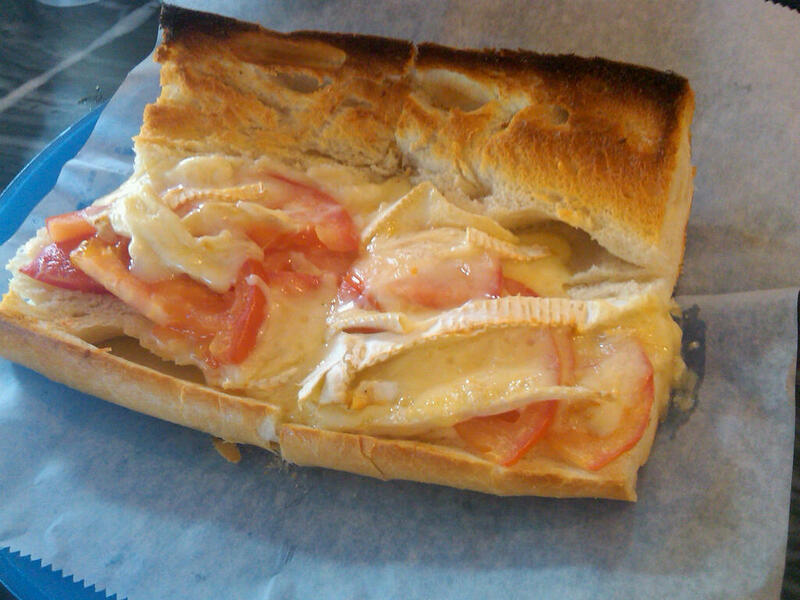 I got brie and tomato and my husband got one of their french-named sandwiches whose name I cannot recall. He also pulled the perfect point and order because neither of us knew how to pronounce the name of his sandwich! My tomato and brie. Simplicity. 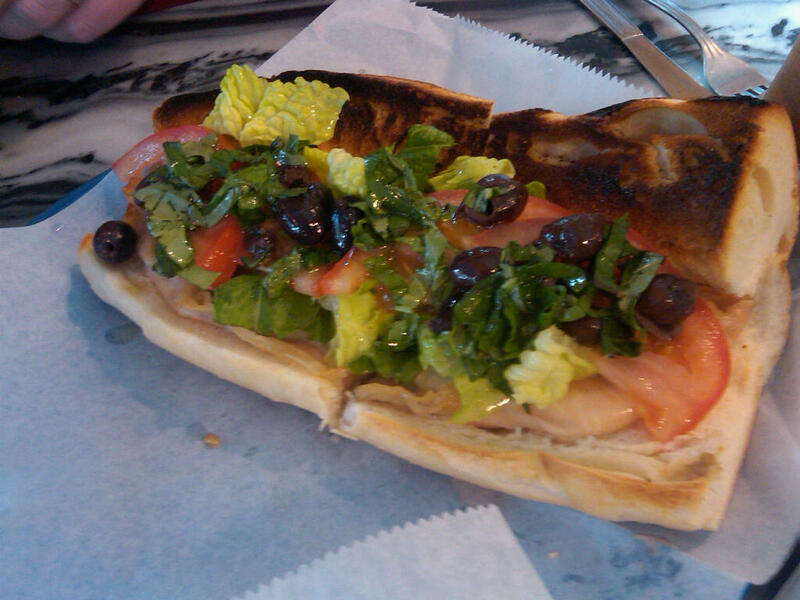 His “name forgotten” french sandwich with olives, lettuce tomato, herbes de provence and capicola or some other porky meat. OK, my mind was bigger than my stomach but that allowed for a tasty snack later that day. Cafe Lutecia is a tiny little french gem that never fails to deliver. And they have the best tomato bisque in the whole wide world. This makes me love them.